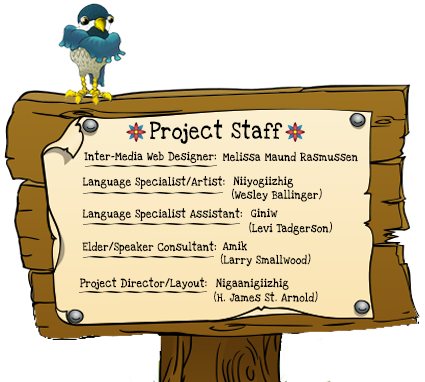 This website and its language resources are intended as tools for Anishinaabemowin accessibility, and by no means are a replacement for our speakers and elders. You should always consult with your area's speakers and elders to ensure proper representation of your specific dialect. This project was made possible through grant funding from the Administration For Native Americans (ANA). The Great Lakes Indian Fish & Wildlife Commission (GLIFWC) is an agency of 11 Ojibwe tribes from Michigan, Wisconsin and Minnesota, all signatories to treaties retaining off-reservation treaty rights. Nenda-gikendamang ningo-biboonagak (We Seek to Learn Throughout the Year) is directed toward language acquisition and preservation for the 11 member tribes of the Great Lakes Indian Fish & Wildlife Commission. "Giishpin ganawendaman gidinwewininaan, giga-ganawenimig aadizookaan gaaganawendang Anishinaabemowin." • GLIFWC is committed to the implementation of its members' off-reservation treaty rights to fish, hunt, and gather in the ceded territories. • GLIFWC is committed to the preservation and enhancement of the natural resources so harvest opportunities will be available for generations to come. • GLIFWC strives to infuse Ojibwe culture and values into all aspects of its work.